Bearings allow one or more parts of a machine to move in a controlled way with least friction. On a lathe they hold the headstock spindle firmly, preventing unwanted movement and vibration, while allowing smooth rotation with little wear. There are usually two types (plain and rolling) and they have to take two types of load - static and dynamic. 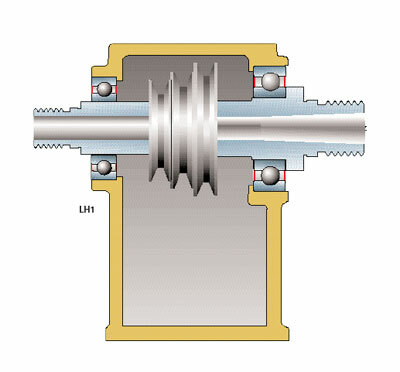 Static is the load on the bearing when the spindle is stationary. Dynamic refers to the load while it's rotating. Static loading is only of importance on machines with a very large turning capacity, because, a rotating bearing is capable of withstanding higher loading than one at rest. Bearings for rotating shafts or spindles are usually referred to as 'Journal Bearings', as their main function is to support rotational forces. 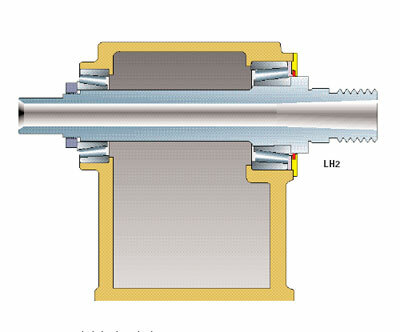 However, lathe spindles are also subjected to end thrust loads, particularly in faceplate work, where the cutting force is directed more towards the end of the spindle. 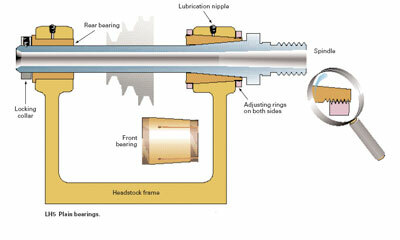 So this should be taken into account in the overall design of a lathe. The design of the headstock housing can make a big difference to the successful performance of bearings. The size of the headstock will dictate the size of the bearing housings, and as in other aspects of lathe design, the sturdier the bearings, the better the life and performance obtained from them. The spacing between bearing housing is also important, because those poorly spaced won't have the same life or stability as widely-spaced ones. Correct bearing alignment is critical. Incorrect alignment probably causes more premature bearing failures than anything else - often signalled by excessive heat, bearing noise, or vibration. Obviously not all such ills can be blamed on the headstock. Spindle design is also important - it must be rigid enough, and allow the bearings to be accommodated correctly. Plain bearings are made from a suitable low frictional material - sometimes simply a block of such material with a hole matched to the diameter of the shaft or spindle. In higher load applications, such as a lathe spindle, the choice of material is ideally a copper-based alloy, such as a phosphor bronze. 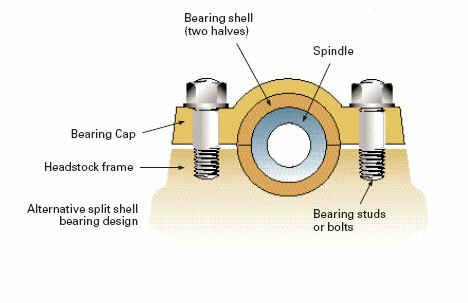 The main drawing (picture 2) shows a typical tapered front bearing which can be closed down onto the tapered section of the spindle as the bearing is drawn forward by the action of the threaded adjusting rings. The non-latching taper of the spindle is designed to take some end thrust and, working with the locking collar, prevents 'end float'. In other words, it stops the spindle from moving longitudinally, causing chatter and poor finishes, particularly on faceplate work. The rear bearing is shown as a simple plain journal type without adjustment. Old large lathes would probably have split shell plain bearings housed half in the headstock frame, and half in a bearing cap. In the next part we'll look at roller ball and hybrid bearings. 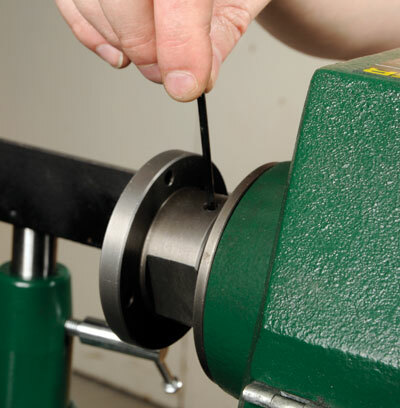 "Static is the load on the bearing when the spindle is stationary"